Standard x86 compatible or x86-64 compatible PC; 733MHz or faster processor; 512MB RAM (2GB recommended); Hard Drive; CD-ROM/DVD-ROM; Ethernet Controller on host for Local Area Networking; Windows Enterprise, Business, Ultimate, Server 2003, XP Home, XP Professional, Server 2000: Linux: Mandriva Linux 2006-2007, Mandriva Corporate Desktop 4.0, Mandriva Corporate Server 4.0, Mandrake Linux 10.1, Mandrake Linux 9.0 – stock 2.4.19, Red Hat, SUSSE, Ubuntu. For many years now virtualisation software has been the provenance of the software developer and beta tester, whose sole need has been a platform on which to test various software applications and operating systems without putting their PCs at risk from possible crashes. Without virtualisation software, operating systems would have required, at best, a dual boot scenario on separate partitions or hard drives, and at most, individual PCs for each operating system tested. Fortunately, virtual machine software gave developers' the opportunity to create virtual computers within the confines of a single machine enabling free movement between operating systems without the need, as one now does with a dual boot system, of closing down the main PC and rebooting to use a different operating system. More and more general PC users have now discovered the art of dual booting; the only inconvenience being, of course, is the fact of having to keep physically re-booting the PC. VMware workstation is the de-facto virtual machine application that can help users achieve the ambition of running multiple operating systems without the need for additional hard drives, multiple partitions or, indeed, the expense of additional PCs. VMware workstation installs directly upon the main operating system (referred to as the host) with any additional operating systems the user may wish to install (referred to as the guest) being installed as files in a Virtual Machine folder on the host machine. Once the guest operating system is installed it can be booted and run just as if it were a totally independent PC. 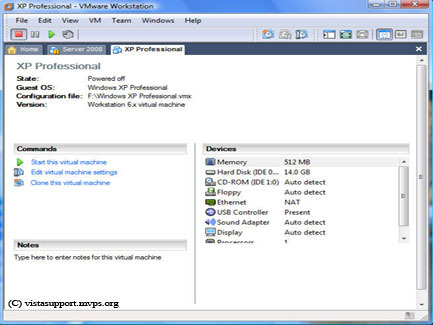 VMware Workstation enables users’ with one single PC to turn it into a number of virtual PCs. The only obstacle as to how many virtual machines that can be create is the amount of available RAM and, of course, disk space. For example, let’s say the host PC is running Windows Vista - preferably Vista Business, Enterprise or Ultimate ( Although it is possible to install VMware workstation on Windows Home Basic and Home Premium the Microsoft EULA (End User Licence Agreement) does not allow Virtual Machine software to be used on these editions) - and that the PC has a total of 2GB of RAM (not an unreasonable amount by today’s standards) available, it would be quite feasible to run Windows XP and Windows Server 2003 as guest systems simply by allocating 512MB of the available system RAM to each guest operating system. 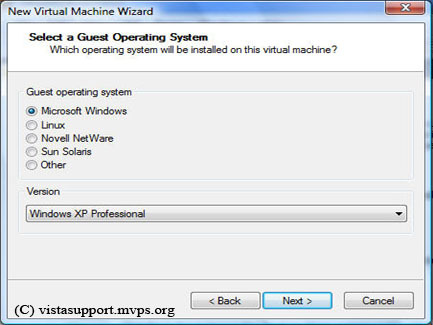 Of course, the host operating system, has to be running in order for the guest operating system to run, but the user ends up with 3 PCs in one, simply by using Virtual Machine software. From the above scenario it is possible to simultaneously run Windows Vista, Windows XP and Windows Server 2003 (or an earlier version of Windows or Linux) from the comfort of a single PC. 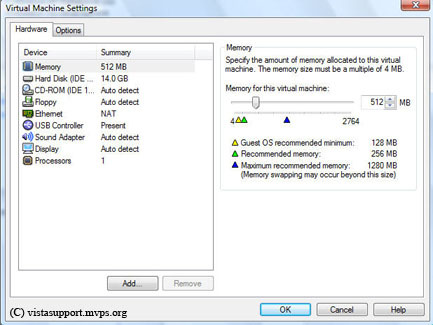 Obviously, running three operating systems simultaneously will affect the responsiveness and general speed of the PC, but this in no way detracts from the purpose and general usefulness of VM software, and can easily be overcome by either limiting the number of VMs running on the relevant PC or, if possible, adding additional RAM to the overall system. With every new version of Windows there is always the same hue and cry of ‘my current software is not compatible.’ This isn’t an issue with VM software, simply because it is possible to install an earlier version of Windows as a guest operating system on which any incompatible software can be installed. 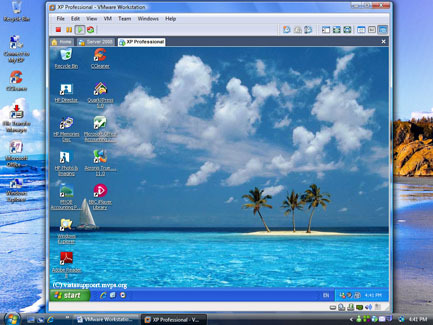 Because VMware workstation emulates graphics and sound it is not yet possible for the Windows Vista Aero graphics to be displayed if Vista is used as a guest operating system. In this instance the display will simply be the ‘basic’ display, which is very similar to Windows XP. Fortunately, VMware workstation has the broadest support for host and guest operating systems, being capable of running both Windows and Linux operating systems as a host and most desktop and server editions of Windows, Linux, Solaris X86, Netware and FreeBSD as guest operating systems. You are not even restricted to 32Bit editions of the operating system, either. The current version of VMware Workstation happily supports both 32Bit and 64 Bit operating systems as host or guest. 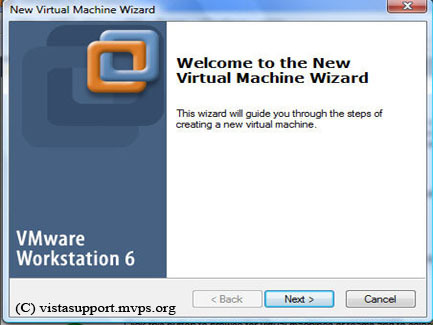 Creating a virtual machine is simple using the Virtual Machine Wizard. The VM is fully configurable so the user is in full control of such things as VM memory size, disk, I/O devices and support for CD, DVD, Floppy and Sound (emulates Creative Labs Sound Blaster Audio PCI). With VMware workstation also supporting USB 2.0 devices removable hardware devices such as USB printers, Webcam’s etc., can easily be linked via the host to the guest operating system. VMware workstation also supports the use of multiple monitors, giving the user an even richer desktop experience. Unfortunately, MIDI input, Games controllers and Joysticks are not supported by VMware workstation. VMware workstation is networked to the host PC via a bridged, NAT, host only or customised virtual networking connection, enabling the guest operating system to have direct internet and networking access via the host machine. It should be noted, however, that because the Virtual Machine is networked to the host machine it is essential to install separate antivirus/firewall (unless using Windows built in firewall) and Spyware software on both the guest and host PCs in order to protect both PCs from any possible security breach. VMware Workstation is a simple but effective alternative to dual booting or the safe testing of operating systems that may compromise the users main PC. Workstation is fully featured and even includes drag and drop functionality (once the VM Additions, a set of enhanced tools, has been installed) between the Host and Guest. Access to a second operating system is simply a mouse click away; no longer is there any need to reboot the PC simply to gain access to another operating system. While VMware Workstation doesn’t come cheap the savings on additional PCs and hardware alone far outweigh its initial cost; and as far as Virtual Machine software goes VMware Workstation certainly out performs the competition.